The Wilbur Rehmann Quartet: "Big Sky Jazz"
I recently had the pleasure of playing with one of Montana's legendary saxophonists, Wilbur Rehmann, during one of his frequent visits to the Bay Area. Known for his keen ear and smooth tones, Rehmann is the leader of the "Wilbur Rehmann Quartet", and the man behind "Montana Jazz". "Rehmann and his Quartet," wrote Mike Clark of the Great Yellowstone Coalition, "have brought to us a sense of joy, wonder and solitude with their original jazz interpretations, which explore the interior landscapes of the American West and the meaning of wilderness". Rehmann's "Going Down the Gulch" is but one of many fine examples of that style, and embodies a true "Big Sky Jazz" sound. Rehmann grew up listening to the last of the traveling big bands in the late forty's and early fifties. and as a teenager, got interested in bebop and wanted to know not only why they played like that, but how. Now he knows, and he plays it on the alto, soprano and tenor saxophones. Watching and listening to him play is definitely a joy. Rounding out Rehmann's quartet is guitarist "Blackie" Nelson, one of the most creative and inventive musicians around. Nelson is also one of the sweetest sounding guitarists in Montana, and apparently knows more songs and music than any one person ought to. In 1954 he and his wife Isabel drove to Bozeman to hear Charlie Parker who personified the cutting edge sound of his day, and that's exactly what Nelson is today. Bassist Ken Nelson does it all, and he does it well. Acoustic and electric bass, piano and synthesizer, organ and guitar and, of course, dobro. He has a tremendous sense of time and rhythm but it is his harmonic explorations that continue to amaze and enthrall. Drummer and percussionist Dennis Unsworth plays his full kit with exquisite sensitivity and grace His quick wit and melodic sense come through whether it's taking a full-fledged solo flight or when he's simply trading fours with the rest of the group. The group's two albums, "Back Home Jazz" (1996), and Mann Gulch Suite, (1999) have an underlying message unique to jazz, (or any other genre to be fair); protecting the environment. 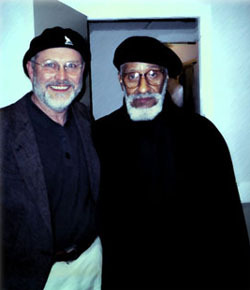 Rehmann's concern for a clean and healthful environment, and his desire for everyone to be made aware of the effects of pollution and global warming, are clearly a motivating, if not inspiration force in his music, and a passion shared by many of Rehmann's friends and colleagues, including the legendary saxophonist Sonny Rollins. Rehmann's delightful "Nica's Dream", is another fine example of his spacious, airy sound of "Big Sky" jazz, free to roam and soar, swoop and swing. Rehmann plans on expanding his group to quintet for an upcoming event, with the addition of percussionist Jeremy Slead. There are also plans for a Bay Area show in 2006, featuring Rehmann and some fine local jazz musicians. Meantime, visit Rehmann's informative site at montanajazz.com, and learn that, yes, you really can swing in Montana.